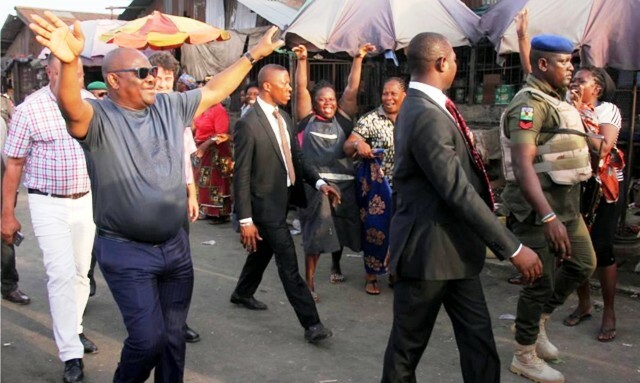 Rivers State Governor, Chief Nyeson Wike (2nd left), acknowledging cheers from Rivers people in Port Harcourt, recently. 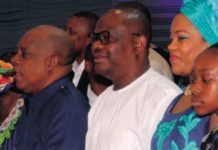 The Governor recorded a landslide victory at the March 9, 2019 governorship poll. The Rivers State Governor, Chief Nyesom Wike has called on the Minister of Transportation, Chibuike Rotimi Amaechi to join hands with him to develop the state. 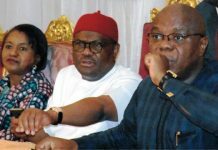 In a state broadcast in Government House, Port Harcourt, to mark the landmark Supreme Court Judgement striking out the appeals by Rivers APC, yesterday, Wike said that Rivers State stands to benefit more if all leaders are united. He said, “Although the present politics of acrimony and bitterness may have strayed from the noble path of the past, I still believe that we shall be of better standing and working together for our state and our people. “I, therefore, appeal to the APC and the Minister of Transportation to join hands with us to move our dear state forward. We cannot as leaders continue to remain divided and expect government to deliver on its responsibilities to our people. Let us from henceforth seek the common ground instead of allowing our differences to be exploited to retard our march to progress. “I appeal to our people to eschew all acts of acrimony, criminality, unrest and violence throughout the state. I wish to recommit myself to continue to do all that is humanly possible to ensure the unity and peaceful co-existence of all our people irrespective of political affiliation”. He said, “I hereby direct the Honourable Attorney General and Commissioner for Justice to review all pending criminal proceedings filed against any person by the state and directly related to political activities prior to the 2019 general election, and make appropriate recommendations to me for necessary action to promote reconciliation among us”. Wike pledged to run an inclusive government aimed at promoting the development of the state. He said, “Today, I recommit myself to be the governor for all the people of Rivers State for the next four years. Accordingly, we shall form an all-inclusive government to advance the collective interest of all our people, irrespective of party, ethnic or religious affiliations. “We have come a long way in the last four years, and accomplished a lot to be proud of. But there’s still a lot more to do to advance and realise the ultimate vision of our founding fathers for a truly united, secure, and prosperous state and we need the support of all our people to realise this bold vision. 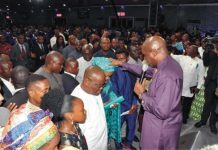 Wike expressed gratitude to God for the Supreme Court judgment, and assured Rivers people that with the judgement all legal tussles have come to a close with the people having nothing to fear. He said, “Few hours ago, the Supreme Court of Nigeria struck out the consolidated appeals of the All Progressives Congress (APC) and Tonye Cole for lacking in merits. He added, “Let me also express my deepest gratitude to the people of Rivers State for the opportunity to serve you as your governor for another four years. I am truly humbled by your continued trust and, I will not take this support for granted. 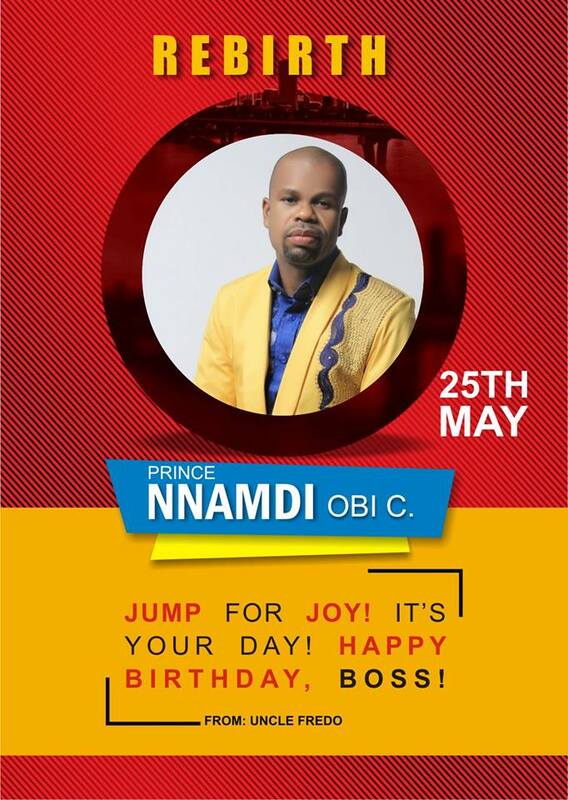 “For me, the collective interest of the people of Rivers State is the reason I am in politics. When you gave me the mandate about four years ago, I committed myself to be the governor for all the people of Rivers State and stayed through to that commitment”. Earlier yesterday, the Supreme Court had struck out three appeals filed by the All Progressives Congress (APC), Architect Tonye Patrick Cole and members of his faction of the party, against the judgment that excluded the APC from fielding candidates in the last elections in Rivers State. A seven-man panel of the apex court, led by Justice Tanko Ibrahim Muhammad, held that the three appeals were defective, incompetent and could not be heard by the court. The appeals are: SC/295/ 2019 filed by APC, with People’s Democratic Party (PDP) and Independent National Electoral Commission (INEC) listed among respondents; SC/266/2019 filed by APC, with Senator Magnus Abe and others as respondents and SC/267/2019 filed by Tonye Patrick Cole, with Senator Magnus Abe and others as respondents. Muhammad, in the first ruling delivered on SC/295/2019, upheld that argument by PDP’s lawyer, Emmanuel Ukala (SAN), to the effect that the notice of appeal filed by the APC was defective. The same errors were noticed in the other two appeals, which made the appellants’ lawyers, Jibrin Okutepa (SAN) and Tuduru Ede to withdraw both appeals, following which the court struck them out. The Acting Chief Justice of Nigeria, Justice Tanko Muhammad, in a lead judgment, sustained the preliminary objection by PDP Counsel, Emmanuel Ukala (SAN). The acting CJN said that, “The Preliminary Objection is meritorious, accordingly the appeal, is incompetent and is hereby dismissed”. It would be recalled that Counsel to the PDP, Emmanuel Ukala, SAN, had urged the court to strike out the appeal or dismiss it in its entirety as the reliefs sought by the APC could only be granted at the Court of Appeal and not the Supreme Court. Okala argued that the appeal by APC was filed outside of the time provided by law, maintaining that the Supreme Court takes seriously its rules on filing of notice of appeal, saying that the non-compliance to those rules renders the process incompetent. Earlier, Counsel to the APC, J.S. Okutepa (SAN), had urged the Supreme Court to overrule its decision on earlier judgement delivered in the consolidated appeals, which held that the appeal before it was a pre-election matter. He argued that the Supreme Court could set aside its decision, if it was taken contrary to constitutional provision. Counsel to INEC, Don Umalor, who did not file any brief, said that INEC would like to remain neutral and non-partisan in the matter before the court, submitting that the commission would want the apex court to decision based on what was available to the court. 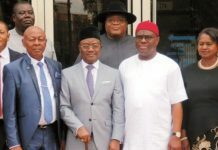 The Tide recalls that the Federal High Court in Port Harcourt had on January 7, nullified the direct and indirect primaries conducted by the two factions of the APC in the state. Justice Kolawole Omotosho, who presided over the case, also restrained the Independent National Electoral Commission (INEC) from presenting Tonye Cole and Magnus Abe as governorship candidates in the 2019 General Election. Following the court order, INEC excluded the APC from the ballot. The elections have been concluded with Rivers State Governor, Chief Nyesom Wike duly re-elected. Meanwhile, the factional leader of Rivers State APC, Senator Magnus Abe has stated that he was not surprised that the Supreme Court struck out his motion seeking to validate direct primaries held by his faction because the apex court had written him a letter before the election, explaining that it would hear the pre-election matter after the conclusion of 2019 elections. Speaking during a Channels Television Programme, last Tuesday night, Abe said that the Supreme Court had premised its decision to hear the pre-election matter after the 2019 elections on a petition written by the Chibuike Amaechi-led faction of the Rivers State APC, which challenged the integrity of the panel hearing the matter at the time. He said that the Supreme Court’s letter, which implied a judgment, said a new panel would be constituted after the elections had been concluded. Abe said as a senior lawyer, he understood the implication of adjourning a pre-election matter to after the elections. It would be recalled that the Supreme Court had repeatedly declared the primaries and congresses of Rivers State APC null and void on the premise of the judgment of Justice Chinwendu Nwogu. 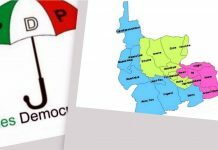 It was on the premise of that judicial pronouncement by the apex court that the Independent National Electoral Commission removed APC from the ballot for 2019 General Election in Rivers State. 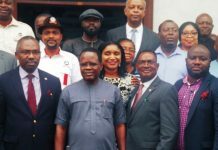 The APC accepted its fate and declared an alliance with the African Action Congress (AAC) during the elections. Abe said, “Because of the delay in hearing the matter, the Supreme Court actually wrote a letter to us, a week before the election to say that the matter could not be heard because the other Rivers State APC faction had written a petition against the judges. “Therefore, the Supreme Court had decided that the matter could only be heard after the elections, when a new panel had been constituted. “For me, as a lawyer, I read that to mean a judgment of the court as far as the issue was concerned. This was clearly a pre-election matter. The effectiveness of the pronouncement would have affected the party going into the election when the court wrote that letter; I saw it as a decision on itself. “When the suit was struck out, it didn’t come to me as a surprise. As far as we were concerned, the decision to strike out the suit was taken when a decision was taken not to hear the suit before the election”, Abe said. Abe noted that the failure of Rivers APC to respect existing order of court at the time led to her misfortune during the 2019 elections. The senator said, “I think that people have to have some basic understanding of what actually happened. As you will recollect, the NWC of APC had asked that the state should make a determination as to the kind of primaries they would use, whether direct or indirect. “As there was an existing court order that nullified the new state executive for the party – so, the existing executive made a request for direct primaries to avoid the existing complications that were already evident at that time. That is the end of the road, legally nowhere else for us to go. “It is really unfortunate; everybody in Rivers State knew that the APC crisis will only benefit Wike. Anybody who pretends that he did not know that the situation we had will benefit our opponent, is not being truthful. “The beginning of this crisis was when members of our party bought forms from the party to participate in our congresses, and a decision was taken that they are no longer members of the party, that wasn’t what the Constitution of the party says”, he clarified. Abe noted that no leader of Rivers APC can solely determine the fate of the party. “This whole issue has been about trying to prove that certain people are irrelevant and certain people don’t matter; that some people are the party, and they can do without others. I want to say clearly that they cannot. “The whole idea of only one person trying to deliver the APC in Rivers State without the participation of others and inclusion of others in the party is a mirage, and it will not work. “We are not baby politicians, we knew after the 2015 elections, that there will be elections in 2019, and we had the same time as other political parties to put our house in order to take over Rivers State. But because of the attitude and the imperial nature of certain persons trying to prove that some people are irrelevant, we found ourselves where we are”, he said. Speaking on the same programme, Counsel to Senator Magnus Abe, Barrister Henry Bello, said they were in court to urge the apex court to pronounce that the direct primaries were valid because the Supreme Court had already invalidated the indirect primaries conducted by the Amaechi faction. Bello said, “We wanted the direct primary elections conducted in Rivers State which was not tainted by disobedience of valid and subsisting orders of court to be recognized by the Supreme Court in Umar v APC reported in 2018”.